Live cell imaging in plants is prone to several limitations, like specific optical properties of plant cell surfaces, presence of vacuoles, as well as environmental requirements for undisturbed plant development and growth during imaging. Subcellular architecture, organization and dynamics of most organelles in cells of living plants can be monitored at the nanoscale using super-resolution microscopy methods, such as structured illumination microscopy (SIM), while long term monitoring of the dynamic cellular changes in a developmental context can be monitored in whole plant organs by light sheet fluorescence microscopy (LSFM). We developed reliable and broadly applicable protocols allowing short term bioimaging of plant cells using SIM (Komis et al. 2015) and long term developmental imaging of plants using LSFM (Ovečka et al. 2015). 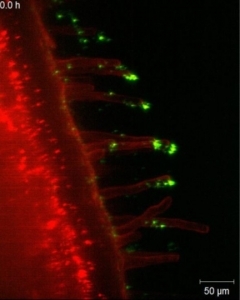 We applied these advanced microscopy methods for clarification of diverse scientific questions, such as monitoring of microtubule and actin dynamics during plant morphogenesis, signalling by mitogen-activated protein kinase during cell division, nuclear changes in diverse root developmental zones and tissues, contribution of secretory vesicles to the oscillatory growth of root hairs, or dynamic behaviour and interactions of endosomes in growing root hairs. Although most of these studies were performed in the model plant Arabidopsis, we successfully established LSFM imaging also in crops such as alfalfa, tobacco and barley. Taking together, time lapse super-resolution imaging of plant cells as well as developmental imaging of whole plants under gentle environmental conditions significantly advanced our understanding of plant growth and development. This work was supported by ERDF project ‘Plants as a tool for sustainable global development’ (CZ.02.1.01/0.0/0.0/16_019/0000827). Komis et al., Nat. Protoc. 10 (2015) 1248-1263. Ovečka et al., Nat. Protoc. 10 (2015) 1234-1247. Please note: A maximum of 20 participants is accepted.